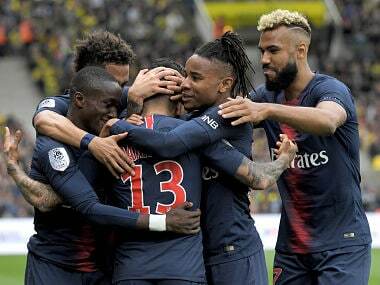 Paris: There was nothing "Classique" about it as Paris Saint-Germain and bitter rivals Marseille conjured up an uninspiring 0-0 draw in relentless rain in the French capital on Sunday. 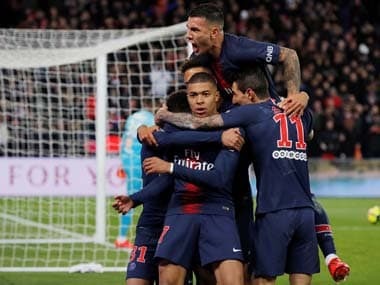 Billed as the Ligue 1 clash to rival Spain's El Clasico, this was a poor advert for French football and did little to dispel the impression that reigning champions PSG are struggling to get to grips with coach Unai Emery's methods. Misfiring PSG striker Edinson Cavani had an evening to forget and the damp stalemate leaves his side in third, two points behind Monaco and six inferior to surprise leaders Nice, who won again despite missing the injured Mario Balotelli. 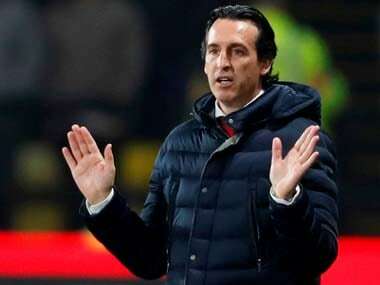 "It's clear that the draw is not a good result for us," said Emery. "But the team had a good match and for 90 minutes we were in charge." There was plenty of rain and endeavour at the Parc des Princes in Paris in the first half but precious little goal-mouth action. 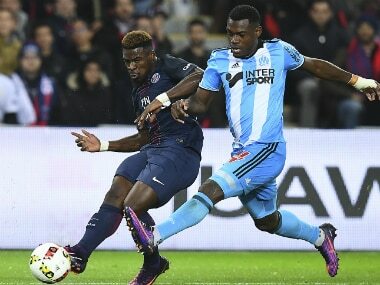 Struggling in mid-table, Marseille, under new American ownership and with new coach Rudi Garcia in charge for the first time, were pinned back for long periods but the Parisians did little with the ball. "It's a positive result. Mission accomplished as we didn't have a shot on goal," said Garcia. It took until 10 minutes before the break for the first real chance of the game, Cavani heading wastefully over for the home side when unmarked and then Serge Aurier shooting straight at Marseille goalkeeper Yohann Pele. Cavani took a tumble in the box under minimal contact just before half-time but referee Clement Turpin was unmoved despite strong appeals from Cavani and the home support, and the PSG players remonstrated with the officials as they trudged off into the break. Both teams emerged with more intent for the second half and captain Bafetimbi Gomis had an early and rare sniff of goal for Marseille, for whom Garcia is their fourth different coach since the start of last season, underlining the instability that has blighted the fallen giants. On 69 minutes Cavani was guilty again of poor finishing, once more heading badly off target when free and unmarked, as the Parisians stepped up the pressure, forcing a series of corners. And 10 minutes from time the long-haired Uruguayan made it a hat-trick of misses, prodding wide from close range when under pressure. Alassane Plea grabbed a hat-trick as Ligue 1 leaders Nice continued their terrific start to the season with a thrilling 4-2 victory at promoted Metz. With Balotelli out with a thigh injury, Plea assumed the lead role for Lucien Favre's unbeaten side and netted the opener on 12 minutes before adding a second from the penalty spot after Georges Mandjeck had equalised. Substitute Habib Diallo made it 2-2 midway through the second half for Metz but Plea struck for a third time on 84 minutes before Wylan Cyprien wrapped up the points in injury time. "It's a deserved win even if it was very tough. We played well," said Favre. "The players' reaction was very good after they equalised for two-all. We're incredibly happy to still be undefeated but we have to keep on working." Earlier, on-loan duo Henri Saivet and Jordan Veretout scored their first Saint-Etienne goals since returning to France from Newcastle United and Aston Villa respectively in a 2-0 win away to Caen. Monaco reclaimed second place on Friday from PSG with a 6-2 demolition of Montpellier at the Stade Louis II.